In an effort to get everyone trying more delicious pizza, we’ve compiled a list of our favorite, less-considered topping combinations. 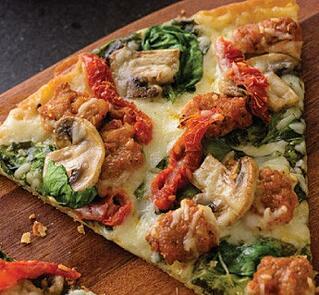 We hope you enjoy trying something new on your next family pizza night! Heat oven to 475° F. Shape the dough into 4 rounds and place on 2 cornmeal-dusted baking sheets. Dividing evenly, top the rounds with the artichoke hearts, spinach, mozzarella, cream cheese, and Parmesan; season with ¼ teaspoon each salt and pepper. Bake until the crust is golden brown, 18 to 20 minutes. Dividing evenly, top the rounds with the barbecue sauce, chicken, provolone, corn, and onion; season with ¼ teaspoon each salt and pepper. Bake until the crust is golden brown, 18 to 20 minutes. Dividing evenly, top the rounds with the mustard, Cheddar, ham, and apple; season with ¼ teaspoon each salt and pepper. Bake until the crust is golden brown, 18 to 20 minutes. Make dinner fun for the whole family by including your kids with these DIY pizza ideas! Happy eating!